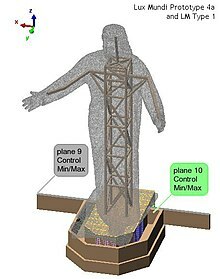 Lux Mundi (Latin for "Light of the World") is a 52-foot (15.8 m) tall statue of Jesus at Solid Rock Church, a Christian nondenominational church near Monroe, Ohio, in the United States. Designed by Tom Tsuchiya, Lux Mundi replaced the statue King of Kings which was struck by lightning and destroyed in 2010. The entire structure was designed using CAD software. The statue shows Jesus stepping forward with a welcoming gesture, a pose inspired by the Gospels of St. Matthew and St. John. Facing I-75, the statue stands on a foundation decorated by rocks with a cascading water feature. Because of its pose and inviting quality, Lux Mundi has earned the nickname “Hug Me Jesus”. The polymer composite and steel sculpture is mainly fabricated by Display Dynamics of Clayton, Ohio. Since the original statue at Solid Rock Church was destroyed by fire, the new statue incorporates fire resistant materials including a lightning suppression system. Following several months of work, the major pieces of the statue were assembled together at the site on September 19, 2012, and it was dedicated eleven days later. ^ McCrabb, Rick (September 19, 2012). "Giant Jesus landmark returns to I-75". Dayton Daily News. Retrieved September 20, 2012. ^ "About Lux Mundi, the Sculpture of Jesus at Solid Rock Church". Tom Tsuchiya. Retrieved September 26, 2012. ^ "Construction progressing on new Jesus statue along I-75". WCPO. June 15, 2012. Retrieved September 7, 2012. ^ Maag, Chris (November 18, 2005). "Giant Jesus statue keeps watch over Ohio interstate". New York Times. ^ Vaccariello, Linda. Rock Solid Sculptor, p. 20. Cincinnati Magazine. ^ "Work to Resume on Jesus Statue at Solid Rock Church". Dayton Daily News. April 4, 2012. Retrieved September 7, 2012. ^ "Ohio town ready to welcome Jesus with open arms". USA Today. August 16, 2012. Retrieved September 26, 2012. ^ "Sneak Peak of Solid Rock Church's New Statue of Jesus". FOX 45. June 22, 2012. Retrieved September 7, 2012. ^ a b "52 foot Jesus replaces predecessor". Cincinnati.com. September 19, 2012. Retrieved September 26, 2012.